We strive to nurture an environment where people have the freedom to authentically express their passion for new concepts. Just like our pop up tents, our ideas are endless. Need to grab lots of attention? We got you covered. Our Tent Flag Package packs four printed 2’x2’ flags that stick up into the air just above the valances, thus increasing your overall visibility. 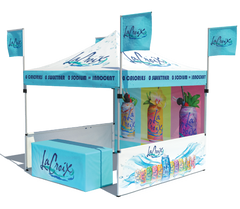 This package also includes a commercial grade frame, fully printed tent top, along with a printed full wall, two printed rail skirts, and a 6’ printed table cover. POP UP TENTS only offers commercial grade canopy frames that are going to last. 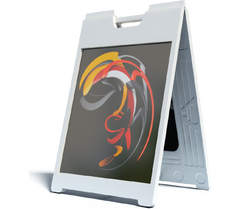 Don’t settle for flimsy frames that stop functioning after a few good uses. Our strong frames include our heavy duty aluminum 8-year warranty Dura Max, our 9-year warranty Rhino Max, and our lifetime warranty Gorilla Max frames. If you’re not sure which one to choose, check out the videos we have on these frames to find out more details. 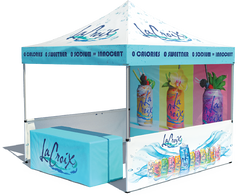 Our fully printed tent tops are constructed using commercial grade materials that are guaranteed to last. A fully printed canopy means that you can go crazy with the design and add as much graphics and art that you want. You can choose to put a lot of logos and art, or you can keep it simple. The design possibilities are endless. This tent top is also NFPA certified fire retardant and 100% waterproof as well, so water won’t ever leak through. This canopy package includes a single sided printed full wall that can be customized any way you want. 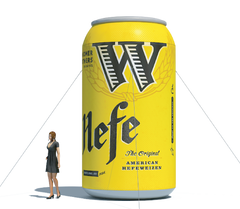 This means you can get unlimited colors, so your tent truly stands out. This wall can also be easily removed via the thick Velcro strip at the top that attaches to the inside of the rear valance. Velcro leg straps also stabilize the wall and prevent it from flapping around due to windy conditions. Rail skirts are nice, short walls that include single sided printing. These low hanging walls enclose the tent while keeping it open and visible to anyone passing by. Rail skirts are also easy to set up and take down. Rail hardware and leg adapter straps are included in this set. Table covers are convenient little standalone accessories that are really quick to set up. This custom printed table cover comes with front section printing, which means you can add logos or graphics to it. Table covers easily fold down into a compact size. The tough vinyl material also makes clean ups real nice and effortless. Tent flags are fun and bring attention to your tent. Our corner flags are made from the same durable material as the tent top, which means they’ll last a while and are also easy to clean up. Our printed flags can be printed with anything you want. If you want all four of them to be unique, we can do that too. The design options are endless. Tent mount hardware is included. Don’t break a sweat by manually lugging your frame around, roll it instead! This roller bag will allow you to easily transport your canopy frame anywhere you need. Need extra space to stash your accessories like stakes and ropes? Use the added front pocket for storing other tent set-up accessories. Trust us when we say this, you don’t want your tent flying away. And yes, it has happened to many tents throughout the world. Don’t let your tent be one of them! Tying your tent down is an easy way to keep it from going airborne. These stakes will help keep your tent in place, so long as winds aren’t too strong. The durable nylon ropes that are also provided, can be tied to sand bags, water barrels, or concrete ballasts for increased security. The Econo Max is our entry level heavy duty pop up tent frame. The Dura Max is our entry level heavy duty pop up tent frame.